I am the inventor, main developer and the project lead of the following software projects. Larger projects lead the list in this section. More than an unit converter - a NumericalChameleon! The version 2 supports more than 5200 units in 93 categories with a precision of up to 1000 decimal places, including not only all important physical units in categories like length, area, volume, electricity, magnetism, force, power, energy, pressure, mass, temperature, velocity, acceleration, radioactivity, fuel consumption, time, etc. but also useful units in non-standard categories like exchange rates, time zones, numbers and time in words (literally and by audio), roman numerals, geographic coordinates, radixes, fractions, checksums, bits&bytes, screen resolutions, colorcodes, unicodes, international dial codes, calendar and holiday calculations and many more. "Java Checksum". Jacksum is software for computing and verifying checksums, CRCs and message digests (known as hash values and fingerprints). Free Software, Open Source, and platform independent. The XML-holidays project suggests an open source standard how to formulate international holidays in XML and it provides actual holidays definitions for many countries. With BigAl you can calculate really BIG numbers with an accuracy your desktop calculator is still dreaming of. The only restriction is the power of your computer! Free Software, Open Source, and platform independent. bash berries is a collection of tiny scripts written in bash. If you double click on a jar file, and your Java application does not start, your .jar association has been hijacked. On Windows, you can fix the problem with Jarfix. The script called osxapp_vers finds the complete product version and build version of OS X in an Install*OS X*.app package and prints it out like the OS X's /usr/bin/sw_vers does for an installed OS X product. Audience: testers, developers, and all who have downloaded OS X or have created a bootable OS X install media using Apple's createinstallmedia and don't know the exact OS X version anymore. A few software projects that I implemented in the past and that I want to highlight. The sourcecode for those won't be published. Later projects lead this list in this section. An enterprise server application using a non-relationale database as the backend and network capable clients as the frontend. 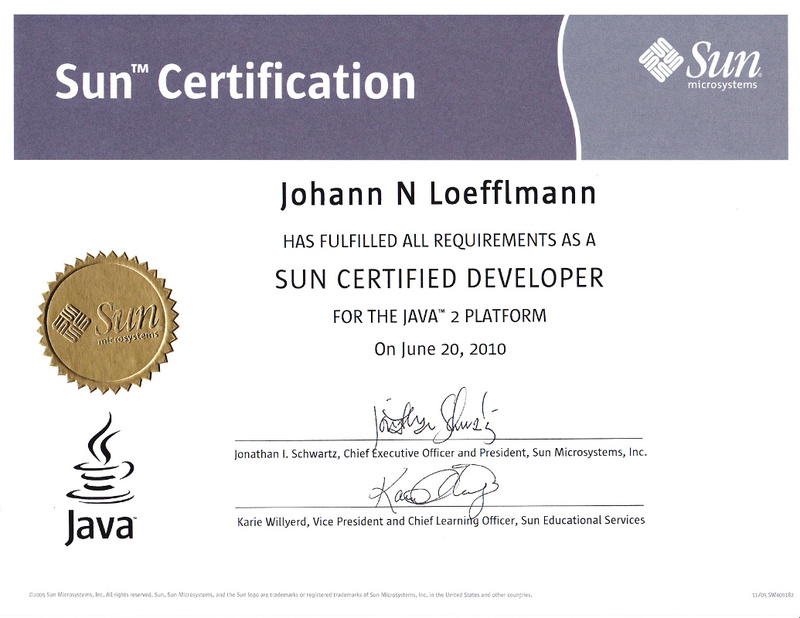 Developed using Java SE only without any resources of Java EE in order to get the certification called "Sun Certified Java Developer". Submitted in April 2010, received the certificate in June 2010. 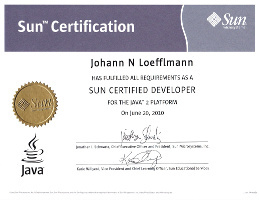 The "Sun Certified Java Developer (SCJD)" has become the "Oracle Certified Master Java SE Developer (OCMJD)" after the Sun aquisition by Oracle. Isis is converter of network traffic dumps to a platform independent "MultiProtocolAnalyzer" format. 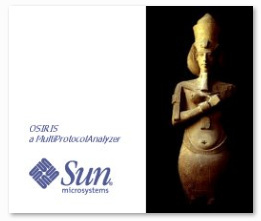 Osiris can read those files and it is an analyzer for multiple network protocols with many unique features and a graphical user interface. During my thesis work at Sun Microsystems in the "Competence Center for Heteregenous Networks" from Juli 1999 to Dezember 1999 both Isis and Osiris have been significantly improved full time. "Tages- und monatsgenaue Abrechnung". Developed in October 1999 for the account staff of an educational institution. Many conditions and Y2K-issue have been taken into account. Time Report for Networkx. A time recording system with a classical client/server architecture. Many features for the user and both text based and graphical corporate report features for the management. Tirex have been developed full time during my internship at Sun Microsystems in Munich, Germany from March 1998 to August 1998.